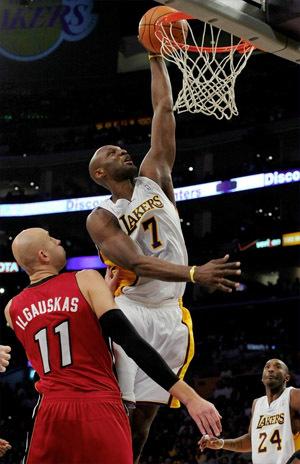 Lamar Odom slams home two against Heat. In one of the most-forgettable Christmas Day games the Lakers have played, the Miami Heat flexed their muscle, and embarrassed the champs 96-80 at Staples Center, in front a huge national television audience. After the game got off to a good start for the Lakers with an 8-4 lead, it fell apart just that quick. LeBron James punished the the Laker defense all game long, got Ron Artest to commit two silly fouls early, and had his way with every other defender thrown at him. James finished the game with a triple-double, scoring a game-high 27 points, with 11 rebounds, and 10 assists, hitting 5-6 from the three-point line. Chris Bosh, who has had his troubles against the Lakers in the past as a member of the Toronto Raptors, found little resistance up front from Pau Gasol, Lamar Odom, or Andrew Bynum on his way to 24 points and a game-high 13 rebounds, including hitting 11-17 from the floor. There’s really nothing positive the Lakers can take from a second-straight beat-down at home. With both the Lakers and the Heat looking for a signature win to start the season, it was the the visitors from Miami who would get the job done on this day. They dominated every statistical category, including outrebounding a much bigger Laker front line 44-43. The Lakers shot a paltry 40.5% from the floor, and just 6-19 (31.6%) from the three-point line. Kobe Bryant led the Lakers with 17 points, six rebounds, and seven assists, but he was frustrated all game long by his teammates’ struggles as well as the officiating. After getting kicked out of Tuesday’s game against Milwaukee with two technical fouls, he picked up another one on Saturday arguing with referees over non-calls. Pau Gasol also had 17 points to go along with eight rebounds, but was a non-factor most of the game. Lamar Odom had 14 points and nine rebounds, and Shannon Brown scored 10 off the bench. 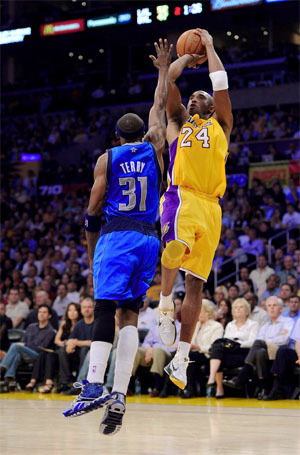 No other Laker scored more than eight points. The Heat held the Lakers to a season-low 14 points in the first quarter, and led 45-36 at the half. After the Lakers got as close as 51-45, the Heat never let them get that close again. Every time the Lakers made any run at the game, James continued to bury the them with long range daggers. And if it wasn’t James hitting shots from deep, it was Mario Chalmers, who hit 3-9 from beyond the arc , en route to 13 points off the bench. About the only bright spot for the Lakers was that Dwyane Wade had a sub-par game, scoring just 18 points on 6-17 from the floor. But he was hardly needed on this day, and he did an admirable job defensively against Bryant. For the first time in Los Angeles Lakers’ history, the team suffered back-to-back home losses of 16 points or more, and only averaged a miserable 79.5 points in the process. It doesn’t get any easier for the Lakers this week. Their next game is Tuesday in San Antonio against the Spurs, who have the best record in basketball at 26-4. They then play a back-to-back game in New Orleans on Wednesday against the Hornets. And they have had a notoriously hard time winning in New Orleans over the years, no matter how good the Hornets are. Andrew Bynum back in action against Wizards. There were two welcome sights for Lakers’ fans on Tuesday night in the nation’s capital. One was seeing center Andrew Bynum on the court for the first time this season, and the other was watching the Lakers get an easy win over an inferior opponent. With Andrew Bynum contributing seven points, four rebounds, and two blocks in 17 minutes off the bench, the Lakers rolled over the injury-depleted Washington Wizards 103-89 at the Verizon Center, in game that really wasn’t as close as the final score. Kobe Bryant led all scorers with 24 points in less than 24 minutes, and unleashed a barrage of three-pointers on the hometown Wizards in the third quarter, that pushed a 10-point Laker lead to 20, and the champs never looked back. Bryant hit three long-range shots after inexplicably missing three straight free throws when he was fouled beyond the arc. 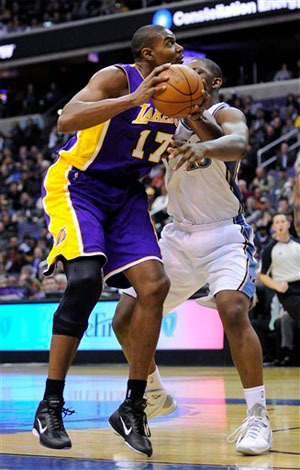 Lamar Odom stayed in his starting role despite the return of Bynum, and scored 18 points to go along with 10 rebounds, making six of his eight shots. Pau Gasol, maybe happier than anyone to see Bynum back on the court, scored 16 points, with nine rebounds, and seven assists, in less than 31 minutes on the night. Shannon Brown scored 16 off the bench, and Ron Artest had a solid night with 10 points on 4-8 from the field. Bynum generally looked good out on the floor, wearing a big brace and black wrap to protect his surgically-repaired right knee. He struggled a bit with his shot, hitting just 1-5 from the floor, and couldn’t get enough lift to finish an alley-oop dunk, but did run the floor well for a player missing the first 24 games, and all of the preseason. The Wizards played without rookie star guard John Wall and center Andray Blatche, and had predictable struggles all night. While they did manage to keep the game within 10-12 points until the middle of the third quarter, they shot just 40.7% from the field, and only 3-19 (15.8%) from the three-point line, which made an uphill battle even tougher. Nick Young, who always seems to play well against his hometown teams, scored 21 points off the bench, but needed 21 shots to do it. Javale McGee had 12 points and nine rebounds, and Gilbert Arenas had 11 points and 11 assists, but shot just 5-15 from the floor, and 1-7 from beyond the arc. The Wizards have now dropped nine straight to the Lakers. It was the first easy win the Lakers have had on this seven-game road trip. And with the second game of a back-to-back tomorrow in Indiana, the starters certainly must have appreciated the extended rest that accompanied Tuesday’s victory. Tomorow night, the Pacers may be without All-Star forward Danny Granger, who is nursing a bad ankle. More help for the Lakers up front may be on the way, as sources have said a three-team trade has been agreed to in principle, that would send veteran forward Joe Smith to the Lakers from the New Jersey Nets, in return for guard Sasha Vujacic. That deal, however, cannot be announced until tomorrow. Pau Gasol lays in two against Wizards. In game that was far closer than it should have been, the Lakers got 32 points from Kobe Bryant and beat the slumping Washington Wizards 115-108 at Staples Center on Tuesday night. The game wasn’t exactly a walk in the park for the Lakers, although it looked like it would be for a while. They led 69-56 at halftime, and by the middle of the third quarter, had a 19-point lead. But the Wizards chipped away late in the period, and cut the Lakers’ lead to 87-84 after three. They got no closer in the fourth, however, as the Lakers managed to make enough plays down the stretch for the 7-point victory. Pau Gasol nearly had his second triple-double of the season. He wound up finishing with 21 points, 14 rebounds, eight assists, and five blocked shots, in almost 43 minutes. It appears that whatever was wrong with Gasol’s hamstring seems to have improved over the last several days, as he showed no signs of injury on the court. Lamar Odom also had a nice night with 24 points and seven rebounds. Shannon Brown added 12 off of the bench. Former USC-star Nick Young scored 30 points off the bench in his return home to lead the Wizards. Gilbert Arenas played his first game against the Lakers in over three years, scoring 23 points. The last time he played at Staples, he scored 60 points in a 147-141 overtime win. That was also the last time the Wizards beat the Lakers, they have lost eight straight since. Rookie John Wall was very impressive, scoring 22 points and dishing out 14 assists, as he showed his incredible speed and quickness in the open court scoring several dazzling layups. The game certainly wasn’t a thing of beauty for the Lakers, as their field goal percentage plummeted in the second half, and they finished shooting just 44.9% from the floor for the game. They also struggled again from the three-point line, hitting just 7-25 (28.0%). They did outrebound the Wizards 45-34 including 22-9 on the offensive end. The Wizards also did turn the ball over 17 times, compared to only 13 for the Lakers. While it may not have been the ideal way to go out before the upcoming seven-game road trip, a victory is still a victory. And with everyone in the West playing so well right now, the Lakers can ill afford to falter against any more sub-.500 teams. The Lakers’ next game is tomorrow night against the Clippers. And while the Lakers are technically considered the “road” team for the game, they really won’t hit the road until they play in Chicago on Friday. It will be the Lakers’ first look at Clipper rookie-sensation Blake Griffin. The Lakers also hope to have Andrew Bynum back at some point on the road trip, as he completed his first full practice on Monday with the team, and experienced no pain or swelling in his knee. A good sign for a return soon.